Welcome to Sterling Sands! 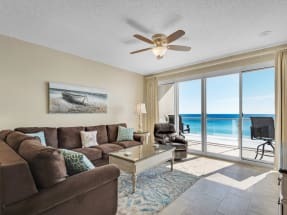 Emerald Coast by Owner is your premiere vacation rental service for this area! Our properties are equipped with our typical elegance, comfort and luxury to satisfy your every need. Sterling Sands is an 8 story condominium complex, with a large variety of awesome amenities for your benefit! A few of them are the outdoor spa and hot tub, large heated pool, fitness room, the convenient location and so much more! There's a large number of nearby attractions, such as Henderson Beach State Park, Morgan Sports Center, The Back Porch Grille, Ruth's Chris Steakhouse and so much more! As for fun activities offered around here, you can enjoy parasailing, deep sea fishing, paddle boarding, jet ski rentals and so much more. If you're looking to go shopping or eat some traditional food, a great place to go is Destin Commons! Destin Commons is an outdoor mall with over 90 stores and a few traditional restaurants such as Smashburger or Wich Wich! As for beachfront seafood in a fun scene, be sure to try out Pompano Joe's and The Crab Trap! Browse our Sterling Sands listings below and be sure to refer to the contact information found on each listing to get in touch with the property owners directly. Booking direct with the owner is the best way to assure you are not over paying for your rental. ECBYO does not charge service fees when you book with us, so book online today and save!